Compared to last week, Western Canadian yearling prices were $2 to $3 lower on average. Feedlots were more aggressive on replacements that will finish for the March April fed cattle market. April live cattle futures continue to trade at a $8 premium to the June contract so lighter yearlings were discounted accordingly. The quality was quite variable with fleshier cattle noted in the Central and Northern regions of the prairies. Medium frame mixed steers with medium flesh levels averaging 917 pounds were quoted at $180 in Central Alberta; Larger frame Angus based yearling heifers averaging 928 pounds were quoted at $172 in the same region. Higher quality backgrounded Simmental based steers averaging 910 pounds were quoted at $185 in Central Saskatchewan. Yearling numbers are limited at this time of year but to be blunt, there’s just no demand. Calves of all weight categories traded $2 to as much as $6 below week ago levels. The market always drops when the first signs of winter appear. This will be the first week that winter blankets Western Canada; buyers were extremely finicky and un-weaned bawlers were severely discounted. Alberta feedlots focused on local cattle; orders flowing into Saskatchewan and Manitoba carried the “trust but verify” risk discount. It was a mixed bag of prices because buyers were afraid of being misled. There are higher costs this year for treating sick ones and the market is adjusting to this new environment. Black vaccinated heifers averaging just over 600 pounds were quoted at $180 in Central Alberta; Angus blend vaccinated 640 pound steers reportedly sold for $202 in the same region. In Southern Manitoba, 520 pound tan larger frame un weaned steers sold for $218; Hereford mixed un-weaned heifers averaging 520 pounds sold for $178. The heifer discount appeared to widen this week. 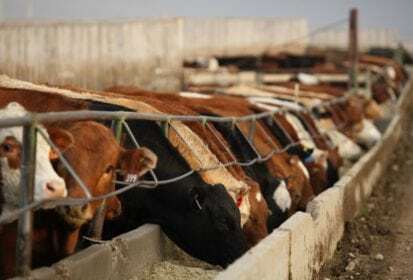 Major feedlots shied away from lower quality smaller groups; this gave the price conscious backgrounder an opportunity but this type of crowd is much smaller this year. Calves that will be hauled longer distances need a fair amount of attention and the market reflected this cost. The yearling market for next spring is looking fairly dismal so there’s no need to be aggressive on these lighter calves.